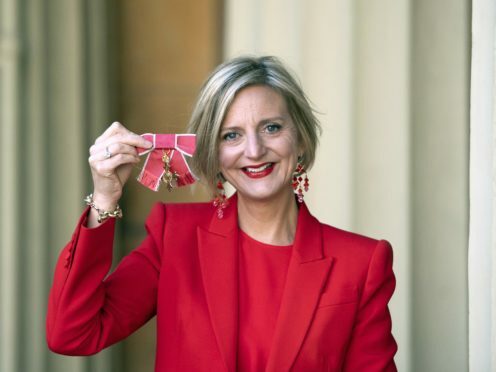 Theatre Director Marianne Elliott after after receiving an Officer of the Order of the British Empire (OBE) medal for services to the theatre, in an Investiture ceremony at Buckingham Palace, London. Marianne Elliott has said the UK theatre industry is “on the crest of a wave” when it comes to diversity and female representation. Her production of Steven Sondheim’s Company, at the Gielgud Theatre, leads the way alongside Canadian musical Come From Away in this year’s Olivier Awards, each receiving nine nominations. Company, which features a female in the leading role instead of Sondheim’s original male casting, is nominated for best musical revival and best set design, with stars including Patti LuPone, Rosalie Craig, Jonathan Bailey and Richard Fleeshman also nominated. Elliott has also received a nomination for best director alongside Stephen Daldry, Sam Mendes, Christopher Ashley and Rebecca Frecknall, who is nominated for Summer And Smoke. She said her best director nod was a surprise, but it was “incredible to be amongst the other nominees because, you know, the men up there have always been the generation above me, leading lights if you like, and everybody knows them to be incredible, so it’s great to be up with them”. Elliott, who has also helmed sell-out productions of Angels In America and The Curious Incident Of The Dog In The Night-Time, is also a Tony award winner. She said Company’s nine nominations were “completely unexpected”. She said: “I mean it’s a total risk, what we did. We took a well-loved musical and put it straight into the West End with a female lead and changed every single theme because we swapped the genders round, so that’s a major risk. Asked about celebrating, she said she would probably be “drinking lots of champagne tonight with the company”. Elliott was awarded an OBE for services to theatre in the Queen’s Birthday Honours last year. The Olivier awards will be held on April 7 at the Royal Albert Hall and will be hosted by comedian and TV presenter Jason Manford.